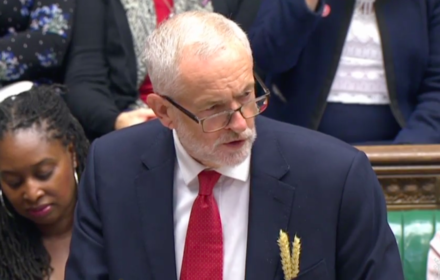 Theresa May had no choice but to praise the excellent services provided by the bodies, which allowed Corbyn to introduce his theme of the day – Universal Credit. The government’s flagship benefits policy is “flawed and failing hundreds of thousands of people”, he declared, and all these organisations have said as much. The Labour leader proceeded to successfully tear Universal Credit apart, citing shocking stats and pointing particularly to the government’s own survey. It found that those who have been transferred over to Universal Credit – which is still in the process of being rolled out – were often “in debt, a third in arrears with their rent, half fallen behind with their bills”. We know that the new benefit, which replaces six others to create a simpler system for out-of-work or low-paid users, has been slammed by the National Audit Office. Their damning indictment came to greater public attention when the minister responsible, Esther McVey, entirely misrepresented the NAO report in the Commons. Many called for her resignation, but it never came. “Does the Prime Minister dispute her own survey?” Corbyn probed. May could only counter his criticisms by referring to the way benefits worked under New Labour. The old “legacy system” led to individuals being doled out £100,000 a year, she argued. Highlighting the record of the Blair era in response to famously rebellious backbencher-turned-leader Corbyn is always a clear sign that the Prime Minister is finding the policy in question indefensible. As the volume in the chamber rose to a possibly unprecedented level, the Prime Minister brought up the latest news of Labour’s internal strife. “Deselection,” she said, and called attention to Chuka Umunna’s remark that Labour had become “institutionally racist”. Whether you agree with some Corbynites that Joan Ryan and Gavin Shuker are overreacting to the letters left in and outside their parliamentary offices, or you think it’s an example of bullying behaviour that deserves a referral to Labour’s disciplinary processes, it is highly improbable that the PM’s attacks will cut through to the electorate. In-work poverty and the disastrous Universal Credit rollout is sure to feature higher on the priority lists of voters than factional rows within Labour, however bitter they might get.